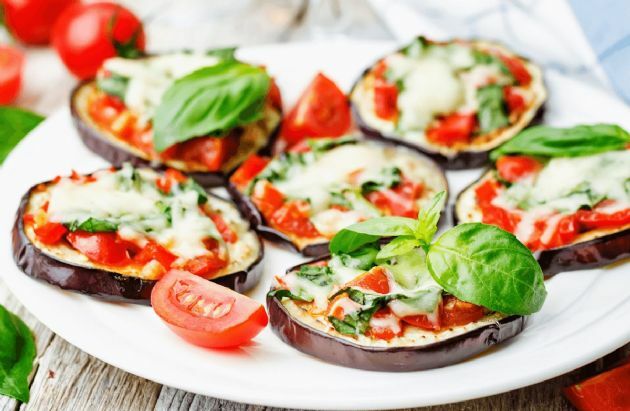 Ditch the crust and boost your veggie intake with these eggplant "pizzas." Ditch the crust and boost your veggie intake with these eggplant "pizzas." Jazz up the flavor by adding some basil leaves to the mix. Preheat the oven or toaster oven to 425 degrees F. Brush both sides of the eggplant with the oil and season with the salt and pepper. Arrange on a baking sheet and bake until browned and almost tender, 6 to 8 minutes, turning once. Spread 1 tablespoon of pasta sauce on each eggplant slice. Top with the shredded cheese. Bake until the cheese melts, 3 to 5 minutes. Serve hot.